On day 2 of our long weekend, we headed for a first-time visit to the ancient city of Surakarta, now more commonly referred to as Solo. We had been surprised when Putri, the hotel's tour organizer, said it would take two hours to drive from Yogyakarta to its sister city, given that the distance is only 70 kms. What we hadn't realized is how far out Yogya stretches in the Solo direction. Distance must have been measured from the perimeter rather than the center of the city. It did take us the full two hours, door to door, even though traffic wasn't a problem: urban sprawl, punctuated by palms and rice paddies. We had a very good lunch in the Soga restaurant in the Danar Hadi batik complex (I'll post later on our meals), which helped make up for the fact that the museum was mysteriously inaccessible. Strolling through the Laweyan batik district was also a pleasure, but the absolute highpoint of our Solo experience was a visit to the palace of the Mankunegaran princes, escorted by an excellent guide, Maryati. The notes below are a combination of what she told us and internet sources; any mistakes will be from my googling. This puro (palace) dates back to 1757, around the time that rebel leader Raden Mas Said, later Pangeran (Prince) Mangkunegaran I, formed his principality to protest the Surakarta king's collaboration with the Dutch. This royal family seems to be considered "junior" to the Pakubuwono kings, who were based at Keraton Kasunanan, but the we thought online descriptions of the Mangkunegaran palace were more appealing, in the same way that British stately homes are often more interesting than royal palaces. On a day trip, we only had time to see one. The main building is an elegant pendopo pavilion, reputedly the largest in Indonesia (3270 square metres) — Javanese style gilded with European flourishes; a museum is at the back and private living quarters are off to each side. Only wooden pegs are used for the teak pendopo, no metal. Lions are from Germany, 1930. Huge expanse of Carrera marble, steps and floor in first photo. Chandeliers from Murano, Italy, 1870. The motif here is fire, the spirit of life. Every color is significant: purple/against bad thinking; red/against evil; orange/against fear; white/against bad desires; green/against stress; blue/against disaster; yellow/against sleepiness. The present rulers and their endearingly humble means of transportation, "the King's Kijang." The royal family is self-sufficient and takes no money from the state. Mangkunegara IX (also written Mangkoenagoro IX, born 1951)was first married to one of Sukarno's daughters, the younger sister of Megawati. After the dissolution of this arranged marriage, he chose his second partner (wedding portraits below) for love. The family is a model for religious tolerance: the older two children are Muslim, the younger Catholic. 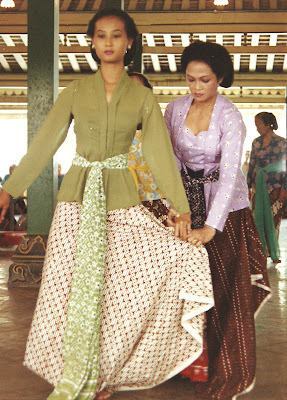 On Wednesday mornings dance practice is held in the pendopo. We missed that, but at least on Saturdays the accompanying gamelan players are playing their instruments, in this case a set from 1850. There are two other gamelan collections on view, one modern and the other the oldest in Java, from 1751, used only for special occasions. Michael couldn't resist taking many photos of the assembled orchestra. Note the presence of two women, playing instruments not, as is more common, singing. Michael liked the juxtaposition of the mid-18th-century instrument and the BlackBerry. While touring the library later, we came across these wonderful stained glass depictions of a gamelan orchestra and female singer. Dutch artist, 1941. 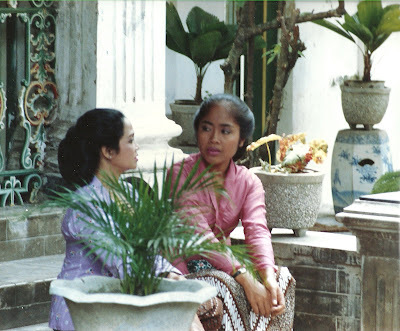 And these black and white photos of dancers, followed by snaps Michael took 25 years ago at the Yogyakarta kraton. In the royal court, dancers must be members of the royal family, virgins who fast for three days prior to performing. The museum was filled with wonders, including 15th-century precious metal chastity belts for women and men, but no photographs were allowed. Considering the amount of solid gold on display, we were surprised that the only guards were women selling jamu (herbs), widows post-menopause. The belief — thus far affording protection beyond what a security system would provide — is that whatever you steal, you will lose ten times its value. Maryati told us that no one who shares this philosophy would even take money someone dropped. The three women guarding the palace treasures and selling their herbal products. Our shoes, taken off before we entered the pendopo, were returned to us in this lovely veranda area. We were also allowed to take photographs again. Michael, the observant one in the family, captured these images of the garden in the wavy silvered glass of old mirrors. Jamu box, with archival family photo. Another garden area, where we met the puppy owned by the prince's brother, who owns the palace shop that would be our final destination. Rare wayang beber, as described in previous post. This tusk took 25 years to carve, 1916-41. Detail from above, complete with bare-breasted maiden and bottles of arak, an alcoholic spirit that the Hindu Balinese see no problem with. I'll close with thanks to the helpful shopkeeper . . .
. . . to Maryati, ever informative and patient, here holding two old wayang beber that we didn't have enough cash to purchase . . .
. . . and to our driver, Bagus, who did a great job for us in Solo and on the next two days' excursions. Dear Carol, this wayang character is the couple figure of Batara Kamajaya and Batari Kamaratih. The names that start with K it's mean Kamajaya and Kamaratih. Batara (Dewa) is like the god of love for the male and Batari (Dewi) is like the god of love for the Female in the story of Wayang Purwa. Some believe that Rama and Shinta, or Panji Asmorobangun and Dewi Candrakirana is the incarnation of Batara Kamajaya and Batari Kamaratih. I hope this bit of info could be useful for you. thanks for the pictures you've sent to us.